The Ford Motor Company in the US is now ramming shopping carts into car doors and blasting water cannons to force vehicles into skids. 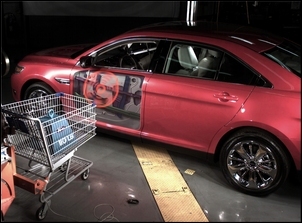 These tests are part of Ford’s ongoing efforts to accelerate new collision protection and avoidance technologies. “These novel tests may seem over the top, but they’re part of a serious testing regimen that Ford had to invent, because increasingly sophisticated technologies require more advanced testing,” said Sue Cischke, group vice president, Ford Sustainability, Environment and Safety Engineering. 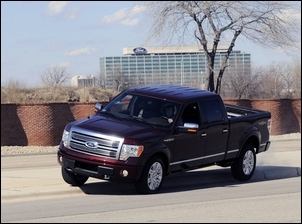 Ford engineers conduct unusual “crash” tests to take thousands of impact readings that help calibrate the sensitivity of new air bag pressure sensors being introduced on the F-150 and Taurus. The new air bag systems use pressure pulses from a side impact to deploy up to 30 percent faster than a traditional air bag system that uses acceleration-based sensors. 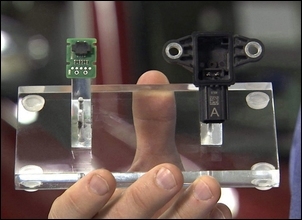 Engineers, however, were concerned that everyday mishaps – such as shopping cart collisions in parking lots or errant basketballs from neighbourhood children – could trick the new sensors that now help predict crash forces before the full impact occurs. The engineers used reams of data from these unusual tests to calibrate the air bag sensor to disregard typically minor collisions. In one test, a lab robot repeatedly pushes a shopping cart loaded with a 110-pound weight into the vehicle doors at 10 miles per hour. 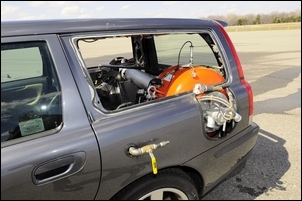 Another robotic test replicates the impact of a bicycle wheel on the car door. Pressure-based sensors more accurately measure the severity of a crash than acceleration-based sensors, which makes them better able to differentiate between a life-threatening, air bag-deployable crash and relatively harmless daily abuse that should not require air bag protection. They also perform better in new US federal side-impact and oblique-impact tests, are less likely to be affected by vehicle design differences, and give designers more flexibility because they take up less space. 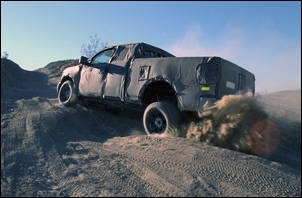 Engineers also conduct air bag sensor research on a test track rife with jarring, jolting surface imperfections, ranging from potholes and chatter bumps to curbs and ditches. There, certified test drivers are encouraged to push vehicles to the limit. 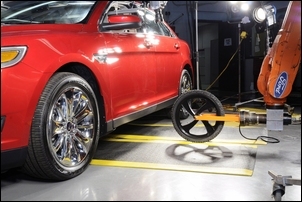 Ford’s safety engineers also have concocted a clever test method using a multi-tailed, lead-tipped steel whip. They use it to repeatedly “pepper” the underbody area where side impact air bag sensors are located. Data collected from such tests is also used to refine sensor calibration. 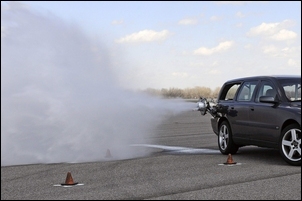 Ford researchers also use a water cannon test to analyse how a moving vehicle reacts to being struck from the side, without putting test vehicles and drivers at risk of damage or injury. Researchers say the new test could prove useful in the development of next-generation stability control technology. In this highly coordinated manoeuvre, Ford engineers mount an air-powered cannon – a tool commonly used in mining operations and pumpkin-throwing contests – in the rear compartment of a test vehicle. 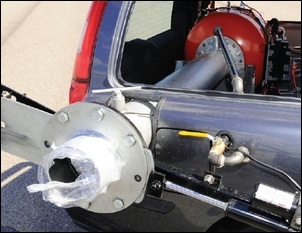 The cannon blasts water outward, causing a recoil impulse that forces the vehicle into a skid. 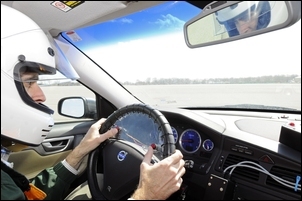 Engineers use the test data in computer simulations to help study how to enhance stability control technology, reducing risks to test drivers and damage to test vehicles.